Comparing the UPPAbaby Vista Stroller and the Bugaboo Cameleon3 can be a pretty arduous task as both these strollers are a top pick for moms looking for a high-end, trendy, and practical stroller. Today we will examine the different features each stroller possess’ and discover the pros and cons between them. Looking at the overall system to start, we see how the UPPAbaby Vista is a modular system, while the Bugaboo Cameleon3 is a convertible system. The UPPAbaby Vista, being a modular system has a separate bassinet and seat making it extremely simple to switch between the two options. This helps mom decide what mode she would like to use that particular day, with each mode at her fingertips. The downside to a modular system is the need to store the full bassinet once the baby outgrows it. The bassinet folds fairly flat and comes with a storage bag, making storage as simple as possible, however for city moms finding even a small space in the closet can be a big deal. The Bugaboo Cameleon3, being a convertible system, has one main frame with two fabric options so you can use either the seat or the bassinet. This entails switching out the fabric each time you want to change between bassinet and seat. Most moms say they switch the bassinet to the seat only once because of the hassle involved. However it does save space since the bassinet is reduced to a small piece of fabric when you are finished using it, making it convenient for storage. Moving on to the physical sizes of each stroller, we find that the UPPAbaby Vista is higher and wider, while the Bugaboo Cameleon3 is lower and narrower. The UPPAbaby Vista is in line with connection psychology, bringing baby closer to mom while strolling. However it is slightly wide and has a bit of a bulkier look to the frame, making it harder to maneuver in smaller spaces. The Bugaboo Cameleon3 has baby at a lower level making strolling connection more difficult, while making it easier to connect with baby in the stroller while dining at a restaurant or sitting on a park bench. The narrower frame also ensures easier doorway and small space maneuverability. The wheels on each stroller differ as well. The UPPAbaby Vista has 8” front wheels and 11” back wheels all rubber coated, while the Bugaboo Cameleon3 has 6” front wheels and 12” back wheels that are foam filled. The Bugaboo Cameleon3 also has the ability to switch out the front wheels to become the back wheels and vice versa, with a simple maneuver of the handlebar. However both strollers have fantastic 4 wheel suspension making sure your baby does not feel the bumps on the pavement, dirt, or grass. The UPPAbaby Vista has larger wheels making hard roadways a breeze, while the Bugaboo Cameleon3 has the added capability of a 2 wheel mode which is wonderful for usage on soft terrain such as sand or snow. Examining next the ease of use on each stroller, we see that the UPPAbaby Vista has the fantastic capability of being able to fold into a singular mode together with the seat in a forward facing position (taking up less space and being easier to fold), while the Bugaboo Cameleon must always fold into two separate pieces. The UPPAbaby Vista also has a larger basket that is accessible easily from both the front and back of the stroller, while the Bugaboo Cameleon 3 basket smaller and harder to access. However, when using the Vista basket you must remove the items before folding it, while on the Bugaboo Cameleon3 you have the ability of being able to keep the items inside the drawstring basket even when folding. The weight of each stroller factors into their ease of use as well. The UPPAbaby Vista weighs in at 25.5lbs contributing to the durability of the stroller with the Bugaboo Cameleon3 at a lower weight of 20lbs making it easier to lift. The break on each differs as well. The UPPAbaby Vista has a footbrake, allowing you to simply tap it with your foot to break the stroller and tap again to release. The Bugaboo Cameleon3 has a convenient hand break with one lift to break the stroller and a simple press downward to release it. Both the UPPAbaby Vista and the Bugaboo Cameleon3 have adjustable handlebars to be compatible for parents of all heights and the ease of both Mom and Dad to switch the height to an amenable position easily. They also both include rain covers in case of a storm. Another feature in common with both strollers is the ability to purchase car seat adapters for most major car seat brands so parents can easily use the frame of both the UPPAbaby Vista and the Bugaboo Cameleon3 with their infant car seat. This is an easy and fashionable replacement of traditional Snap N Go’s. Both strollers can also be given fresh looks with the purchase of additional kits. You can change the color of your UPPAbaby Vista with a Fashion Swap Kit, completely changing out the seat fabric and sun canopy of the stroller. The Bugaboo Cameleon Tailored Fabric Sets allows the same to be done for the Bugaboo Cameleon3, changing the sun canopy of both the bassinet and stroller seat, as well as including a coordinating bassinet apron. Features that are exclusive to each stroller include the following. The UPPAbaby Vista has an extra pop out sun canopy with an SPF 50 ensuring complete sun protection for your baby. The Vista also has the ability to easily convert to a double stroller with the purchase of the UPPAbaby Vista Rumbleseat. The Bugaboo Cameleon3 is the only stroller that is a 3 in 1 terrain system for adaptability to all roads. These include the traditional city mode with smaller wheels in the front and larger toward the back, The rough terrain mode which is obtained with a simple reversal of the handlebar moving the larger wheels to the front to take on tough roads, and lastly the unique hand-truck mode, allowing you to use the stroller as a 2 wheel option for sand / snow. Each stroller is wonderfully crafted and will ensure satisfaction of the buyer. To choose between them you simply need to decide which features are most important to you personally and pick the stroller that has those features. 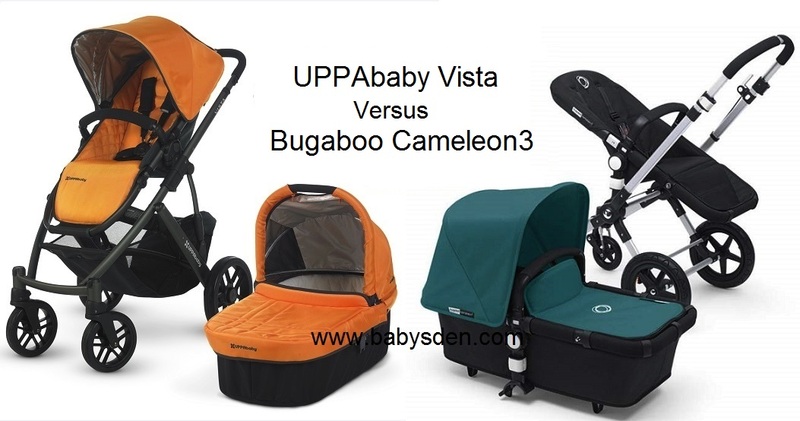 Whichever way you choose, UPPAbaby Vista and Bugaboo Cameleon3 you are sure to be delighted with your pick.